Photos from the recent fires in California show a horrifying post-apocalyptic wasteland of burned homes, forests and vehicles. Dozens of people lost their lives, thousands of homes went up in flames. And thousands of cars were burned down to the bare metal, the tires melted away. Of course, the loss of life and property is tragic. But what happens to a car when it’s consumed by fire? Basically, it burns up real fast. Firefighters say a car can become fully engulfed by fire in less than eight minutes. Today’s cars are supposedly built with fire-resistant materials. But they’re not fireproof. Materials like seat cushions, carpets and dashboards eventually reach their ignition point. The average forest fire burns at around 1,400 °F and can reach up to 2,000 °F, hot enough to weaken steel and aluminum. The car interior goes up in smoke, the tires pop and melt into the ground, and anything under the hood that’s not metal becomes part of the carcinogenic cloud of ash rising from the fire. 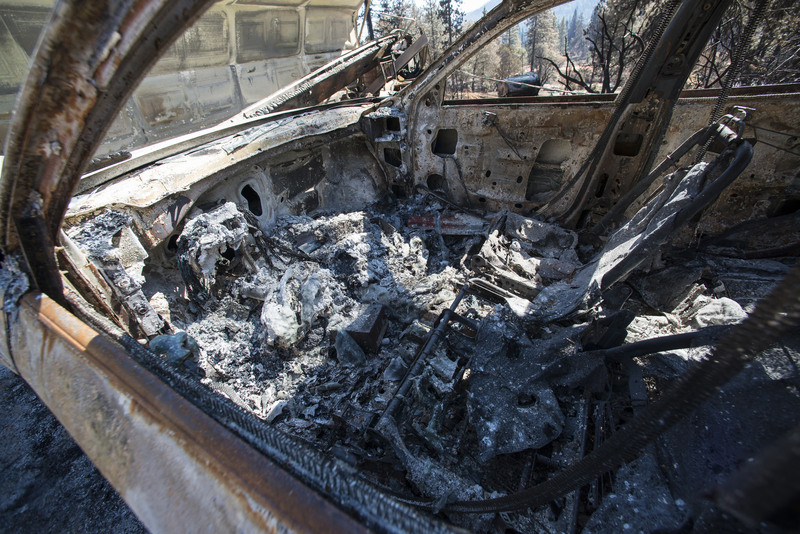 Photos from residents who narrowly escaped the Paradise fire show the plastic wood trim melted on the side of a Jeep Cherokee, like frosting scraped off a cake. It’s interesting to compare photos of older and newer cars burned in the fire. The older cars contained a lot less plastic and a lot more metal. Of course, they’re still just barely recognizable as cars, but the difference is telling. Today’s cars include less metal and more flammable materials. Outside of forest fires, cars do catch on fire for other reasons. U.S. firefighters responded to 229,500 vehicle fires 2007-2011. 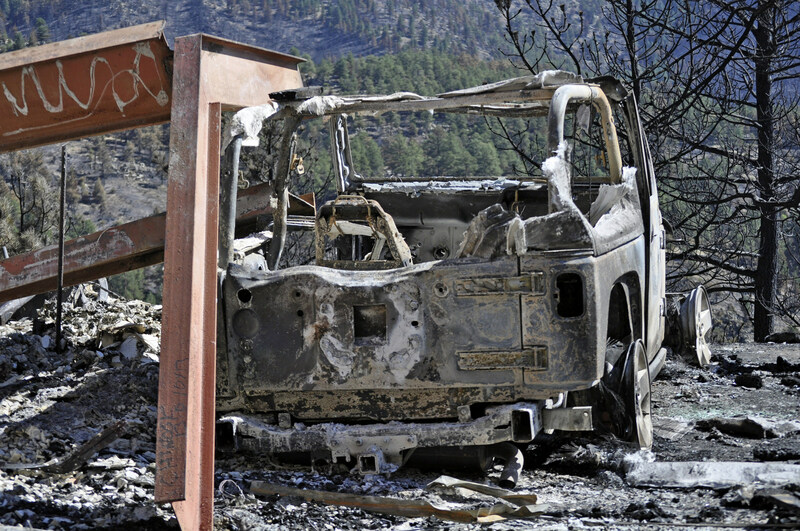 A few automakers have had to recall cars because of fires due to manufacturing or design flaws. The Ford Pinto from the ’70s would be forgotten today except for the fact that more than a few of them caught fire when involved in rear-end collisions. Early this year, Kia and Hyundai recalled 168,000 vehicles at risk for fuel leaks. Six fires are linked to the recall but luckily, no injuries. Teslas had a rash of fires as well, reportedly due to problems with the lithium-ion batteries. One cell gets hot, igniting the one next to it, and soon the whole battery pack is aflame. In a gas fire, firefighter’s foam will suffocate the flames. But on a battery fire, there’s internal heat that must be cooled with lots of water to keep it from reigniting. Gasoline has an undeservedly bad reputation for car fires. You see, gasoline isn’t really explosive by itself. Gas vapors have to be present to create ignition, and the conditions have to be just right. Gasoline doesn’t start burning until it heats up to 500 °F, so the fire has to be going good before gas joins the fun. In a car accident, other fluids in the engine bay catch fire, like power steering fluid or oil. Gas gets blamed, but it’s not usually at fault. Experts say you shouldn’t stand directly in front of or behind a burning car. The bumpers can blast off the vehicle as the bumper shocks heat up and explode. The dampers that hold the hood and trunk open can also superheat and explode, slamming the car hood and potentially breaking the windshield, allowing the fire to reach the interior. Tires heat up and explode in as little as three minutes. Then, hot sticky rubber goes flying up to 20 feet away from the car. Even then, cars don’t usually explode like they do in the movies. It takes some real knowledge about explosives to create a fireball the hero can casually walk away from. Some exotic cars contain magnesium components, which are high strength and low weight. The trouble is, magnesium burns very, very hot, and it’s reactive to water. So if your Porsche Carrera GT catches fire and the local department sprays water on it, things can go from bad to “Holy crap, run!” very quickly. If you live in an area that’s being threatened by a fire, evacuate when authorities tell you it’s time to go. Tragically, in the recent California wildfires, some people neglected to heed warnings in time and were caught in their vehicles. Experts say if a fire is coming toward you, stay in the vehicle and get low in the car to avoid the heat from the windows. The best advice for dealing with a car fire is to get a safe distance away immediately and leave it to the professionals.